Results: Crop soils that are fed with biologically based nitrogen do a better job than synthetic fertilizers at retaining nitrogen, so less escapes into the air and water. Scientists from Pacific Northwest National Laboratory and Canada drew this conclusion after developing detailed nitrogen budgets—inputs, losses, and storage—of three agroecosystems in western Canada. Understanding nitrogen in agroecosystems is important for preventing or minimizing its leakage into the air and water, which contaminates water and increases global warming. 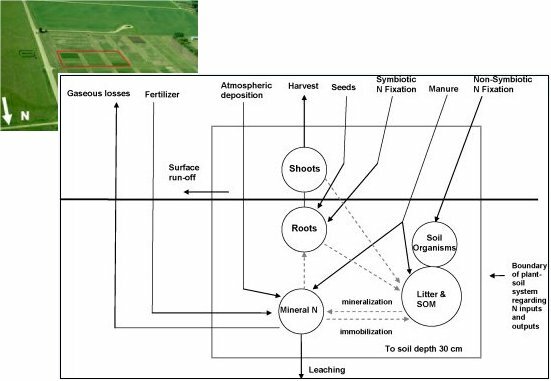 The long-term experiment used in this study was essential to discover the most effective methods to manage agroecosystems for both production and environmental protection. The team found that each year the agroecosystem that relied solely on biological nitrogen retained 44% of its nitrogen in soil, lost 16% to the atmosphere and water, and retained about 40% in the harvested crop. Conversely, the all-synthetic nitrogen system retained 23% of its nitrogen in soil, lost 24% to the atmosphere and water, and retained more than 50% in the harvested crop. These results reveal that a larger proportion of the added nitrogen was lost to the environment when applied as a synthetic fertilizer than when it was derived through biological processes. The conclusion: Adequate management of biological nitrogen sources increased soil nitrogen reserves and reduced nitrogen losses. Why it matters: Nitrogen is a key nutrient for food and fiber production, but it is very reactive in soil. When not used by plants, nitrogen can leak out into groundwater as nitrates or evolve in gas forms into the atmosphere. Excess nitrates pollute water, while nitrous oxide contributes to global warming and affects ozone chemistry in the stratosphere. The challenge is to develop or improve methods that retain maximum nitrogen in plants and soils while minimizing nitrogen losses to the environment. Methods: Researchers used data from the Hendrigan Plots, which were established in 1980 on a 20-acre parcel of land near Breton, Alberta. Three different nitrogen-supply approaches were used for each of three crop systems. The first crop system, an 8-year rotation of cereals and legumes, received its nitrogen from fababean, red clover, and alfalfa as well as manure recycling. The second system, a perennial grass-legume mixture, received its nitrogen from white clover and synthetic nitrogen fertilizer. The third system, a cereal crop, received its nitrogen supply from synthetic fertilizer alone. Biological nitrogen fixation is a natural process whereby soil bacteria interact with plant roots, converting atmospheric nitrogen into a form plants can take up for "feeding." The nitrogen balances were constructed using soil and plant nitrogen data as well as data from the scientific literature. What's Next: Using results from this study, the team will conduct further research on the nitrogen budgets of these three sites using EPIC (Environmental Policy Integrated Climate), a computer simulation model used to determine the effect of management strategies on agricultural production. Acknowledgments: PNNL advances scientific frontiers for U.S. competitiveness by transforming the nation's ability to predict climate change and its impacts. This research was supported by the Natural Sciences and Engineering Research Council of Canada Postdoctoral Fellowships Program and the U.S. Department of Energy's Office of Science, Biological and Environmental Research Program. Research Team: SM Ross, University of Alberta, Canada, RC Izaurralde, the Joint Global Change Research Institute, a partnership of the Pacific Northwest National Laboratory and the University of Maryland, HH Janzen, Lethbridge Research Centre, Agriculture and Agri-Food Canada JA Robertson, University of Alberta, Canada, WB McGill, College of Science and Management, University of British Columbia, Canada. Reference: Ross, S.M., R.C. Izaurralde, H.H. Janzen, J.A. Robertson, and W.B. McGill, 2008. "The nitrogen balance of three long-term agroecosystems on a boreal soil in western Canada." Agriculture, Ecosystems & Environment, 127:3-4, 241-250.